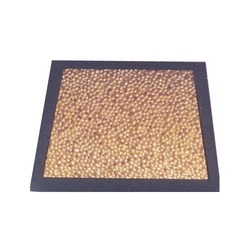 We are ranked as the well-known organization engaged in offering a broad gamut of Sintered Bronze Pad. This pad is designed by our adept industry experts keeping in mind the various application requirements of our clients. Further, they make use of the finest quality raw material combined with modern technologies in order to fabricate this range. Also, we properly examine this product to eradicate any kind of flaws and deliver a perfect range at clients' premises.This one from our end has basic application for installations in gearboxes of machine tools, wire drawing machines. These products offered by us are made utilizing high grade raw material and innovative technology in complete adherence with the international quality norms and standards by vendors. Furthermore clutches and brakes are tailor made and designed as per customers’ requirements. Pad made from sintered bronze are used to fluidize fine powder of different material such as coal ash, cement, plastic etc. Looking for Sintered Bronze Pad ?